Did you know there’s an Official Guidebook for the 56th Presidential Inaugural? It’s free and it’s here. Also, Black Enterprise Magazine featured an article titled Step Out in Style Inaugural Weekend about what to wear and do in Washngton DC this weekend. At the top of their list? Ojamas! Way to go, B.E! When I read Barack’s books, when I listened to his speeches, and as I understood his vision, I was struck by the the power of a dream. As King inspired the world with his dream of equality and justice, so Obama inspires us with his dream of unity and a better America. Experience is in the eye of the beholder, and the quality of one’s experience far outweighs the quantity in my opinion. If you are not registered to vote, unsure, would like to confirm your polling location or have any questions about voting, I urge you to visit VoteForChange.com. Ojamas Sleepwear put together this little montage in support of voter registration. There is no overestimating the power of a dream, and no better way to dream than in Ojamas. 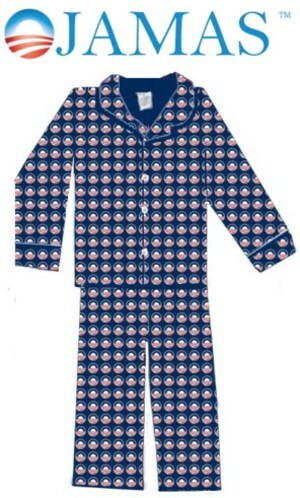 Ojamas Sleepwear is looking for a Michigan choir who wants to lift up Barack Obama in song. 22 children got together back in August to sing a song of hope. Their song has come under criticism from the Right as a professionally scripted media insertion rather than the grass roots effort it claimed to be. Ojamas Sleepwear says, “so what.” We’d like to get a good adult gospel choir to render a version of the song that raises the roof with no pretension other than to lift our man as high as possible. Here’s the children’s version if you haven’t seen it.